Option 1. 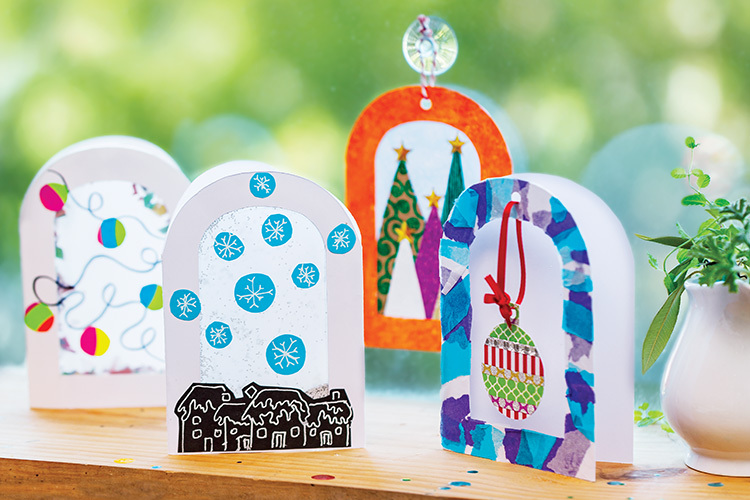 Christmas Village Shaker Card: Glue one of the frosted arch shapes to the inside of snow dome window. Stick double-sided foam tape around the arch’s border, ensuring there are no gaps. Sprinkle confetti or glitter within the border, then place the second arch over the foam tape to seal your shaker window. On the front of the card, create a Christmas village scene with assorted papers and draw details with fineliner pens. Display as an open card, or glue shut and add a hanger to create a shaker bauble. Option 2. Frosted Window Card: Glue one frosted paper arch to the inside of the cardboard window frame. Decorate the front of the window with collage papers or a painted scene. Option 3. Snow Dome Card with Hanging Bauble: Tear small pieces of tissue paper and gluethese around the arch of the snow dome card. Create a bauble from assorted papers that will fit within the inside of the arch. Punch a hole at the top of the bauble and at the top of the arch. Thread a piece of ribbon through the holes and tie with a knot.